Understanding the complementary and parallel needs for and functions of data warehouses and lakes is vital if you want to get the maximum value from both investments. 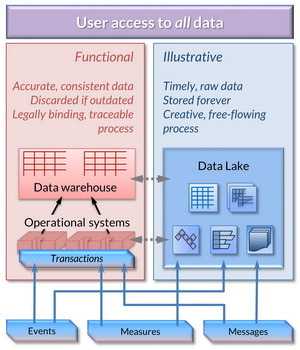 Finally, we can move beyond the conflict between data warehouse and data lake! It’s no longer one vs. the other but, rather, how these two concepts can complement one another for the benefit of both business and IT. First, we explore how to optimally support different business and technical requirements by the appropriate placement of functionality such as data preparation, archival and business access across the two environments. A simple architectural model defines what warehouses and lakes actually are and how they complement one another. This clearly demonstrates the power of such collaborative thinking between traditional and new approaches. A brief description of Hortonworks’ Enterprise Data Warehouse Optimization Solution rounds out the paper.